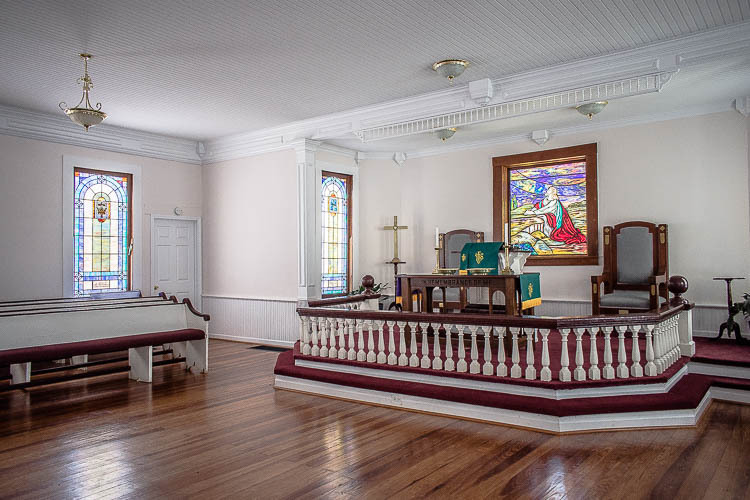 In 1915, members of Fork Chapel United Methodist Church erected a white frame building on three-fourths of an acre, in the small rural village of Greshamville – located northeast of Greensboro in the Oconee National Forest. More than a century later, this beautiful building still stands as a testament to the stewardship of a loving congregation. 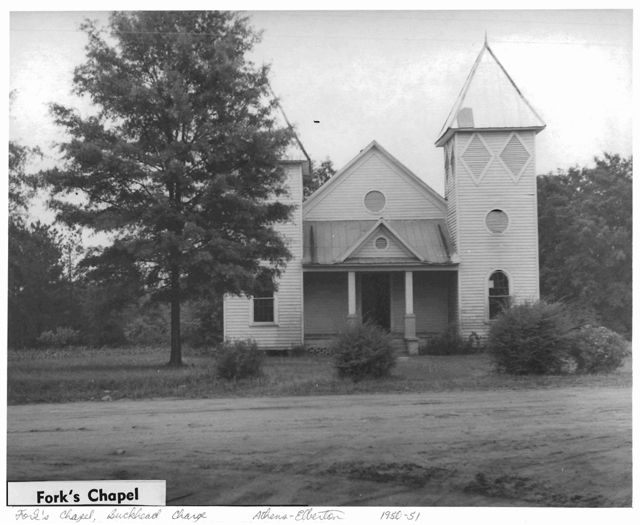 The history of Fork Chapel’s congregation, however, goes back much further. 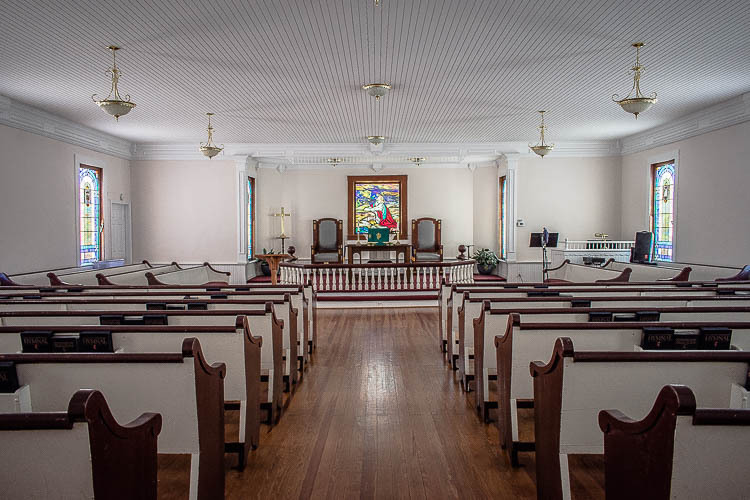 So named because it lies in the fork created by the Oconee and Appalachee Rivers, Fork Chapel Methodist was originally the fruit of Reverend Hinton Crawford’s labor. Crawford, a local planter and Methodist preacher, was born in Greene County in 1798. 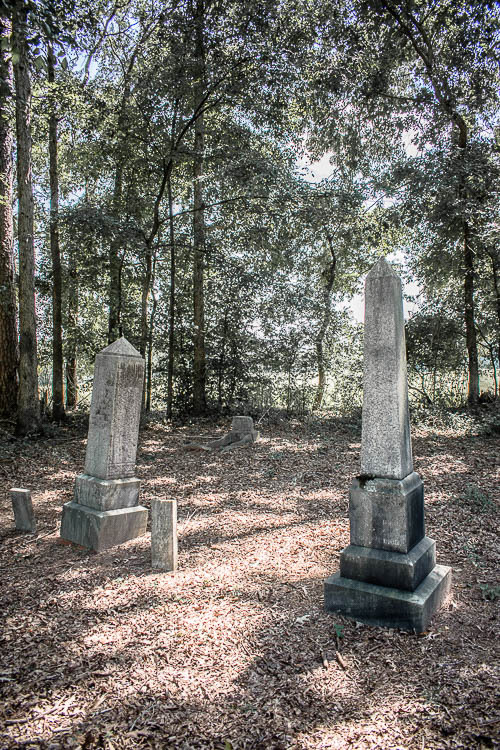 In 1844, after the church had been functioning for some time, Crawford accepted a one-acre donation from Matthew Winfield and gave three acres of his own for a new building and a graveyard. Fork Chapel is a lovely rural church in a bucolic little village setting. 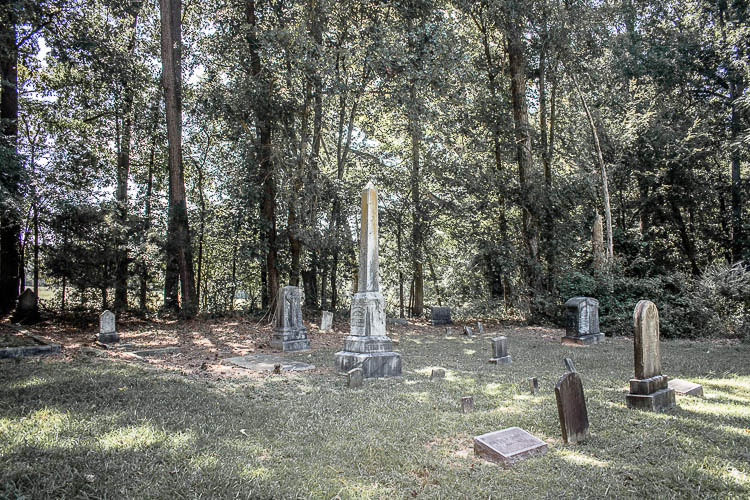 The cemetery, where the original church stood, is located about a mile away and is worth a visit. Many of Greshamville’s prominent early settlers are interred here. According to Georgia Places Names by Kenneth Krakow, Greshamville was named for an old fort built near the Davis Gresham settlement in 1786. Sometime after the new church building was constructed, the old church building was demolished. In its place near the cemetery was erected a shelter, which attendees of the church’s annual homecoming made use of for quite some time. Now homecoming is celebrated every third Sunday in August, and it marks the beginning of the annual revival. As you saw in the exterior photo, Fork Chapel is quite a handsome meeting house. It is a quintessential example of the late 19t.h century Victorian country church. One of the last few built in Georgia, it was completed in 1915-16. Its twin square towers flanking a single gable sanctuary building are the hallmarks of the era. Stepping inside, we see it has a similarly typical, sanctuary interior. The center aisle, all-white interior walls, ceiling, chancel balustrade and pew backs that are wrapped by curved armrests and tops made of darker wood are hallmarks of an era gone by. To discover a period interior such as this… in su ch perfect shape… is a remarkable find. We were drawn to the chancel newel posts you see in this closeup. Please note the large, turned-wood orbs that anchor each end. Also note the white, turned wood balusters supporting the rail. 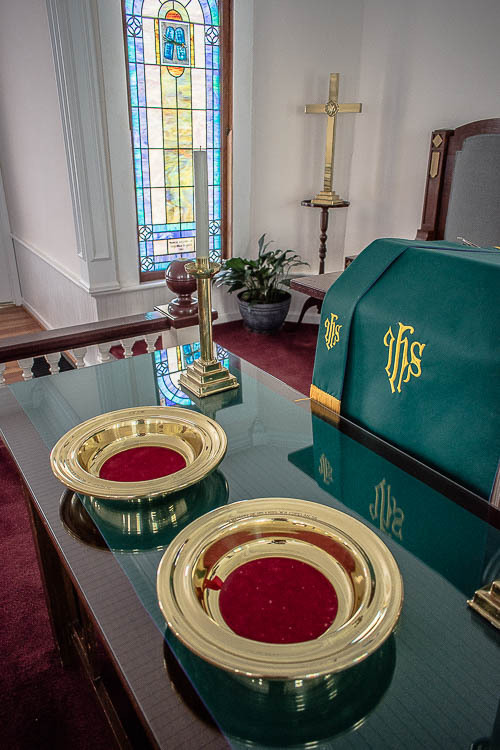 These reflect the highest quality of interior fit and finish that we found throughout the sanctuary. Here we get a better view of the chancel, its attractive balustrade, the communion table, pulpit, period furniture and attractive apse. This area is flanked by two attractive tall, stained glass windows whose colorful panes cast a soft light on the area. An in the previous photo, we have chosen a similar view from pulpit right of further examples of superior construction and decorative detail that one would not expect to find in a still very rural area of Greene county. 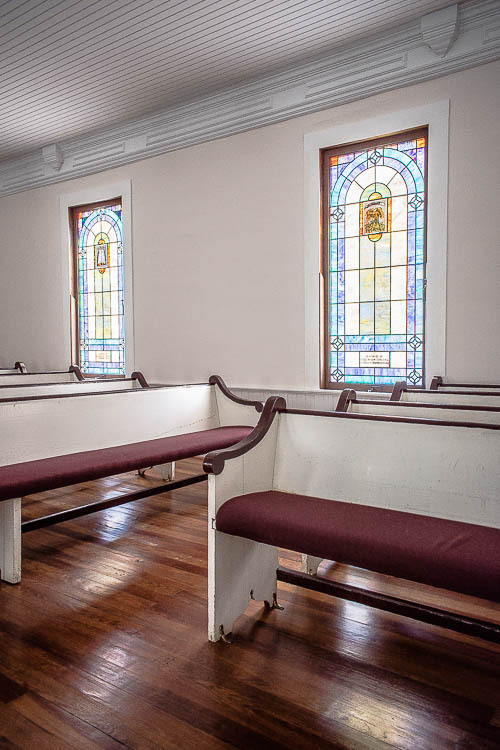 Here we can direct you attention to the solid pine flooring upon which sit the handsome, original pews with their graceful, wooden armrests. Resting on a decorative wainscot, the church contains period, large stained glass windows in tasteful wooden frames. At the top of the wall we can see a large decorative, bracketed ceiling molding that flows smoothly into the vertical, tongue-and-groove ceiling. These are expensive decorative elements not often found in the country! They are here because this church was constructed in the prosperous period preceding the depression and the catastrophic boll weevil invasion that crippled the South. They had the money to splurge. The fact that the building exists today…in such wonderful condition… is a tribute to the stewardship of the Fork Methodist congregation…. Then and now. 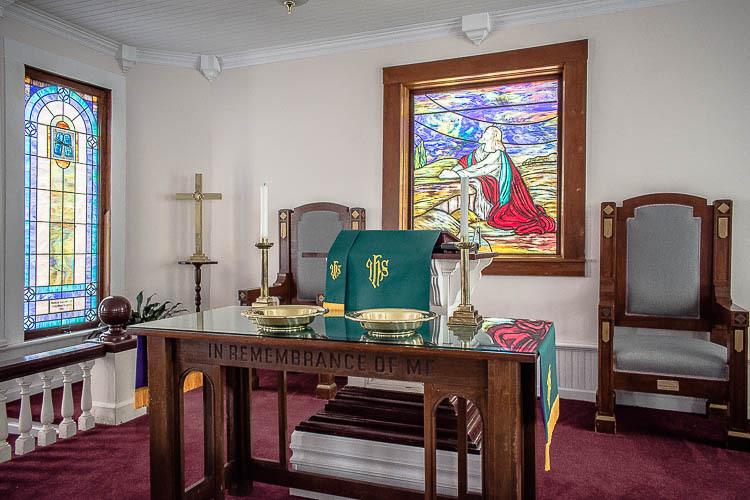 Fork Methodist still has an active and dedicated congregation. This charming picture indicates that regular services are held. We are always pleased to be able to offer a “then and now” look at the churches we are documenting…that, unfortunately, is not very often. In this case, we are lucky to be able to present a picture of the church as it looked in 1950. As you can see, “this old church” is standing tall and totally recognizable today over 65 years later. We thank the Fork Methodist congregation for saving this treasure and monument to the past for all to enjoy for decades to come. Here we see the large grave enclosure for the prominent Armstrong family with birth dates starting beginning before1837. The very elaborate wrought iron enclosure is indication of the prosperity of this family. The presence of the many huge, marble monuments (“base, die and cap style” usually made by Sears, Montgomery Ward and others starting in the late 1800’s) provides further proof of family’s continuing wealth through the 19th and into the 20th century. 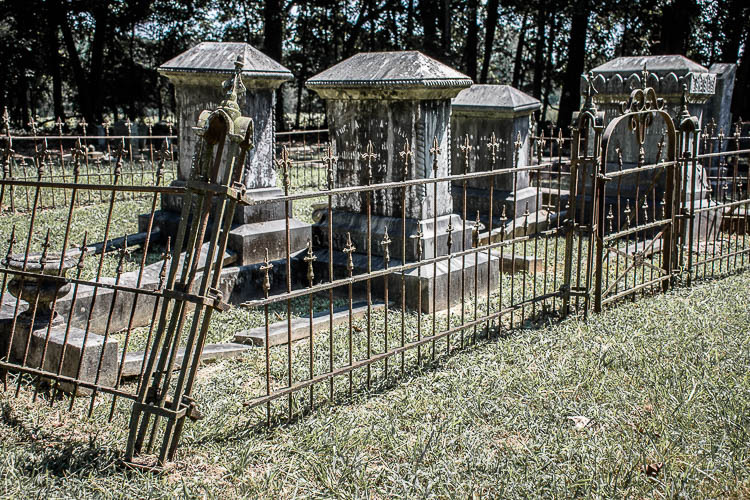 This cemetery provides countless clues into the social history of this church and community. Here we see another attractive and expensive style of monument, the Obelisk, which dates from ancient Egypt and was then re-popularized in the United States in the mid-1800’s. This magnificent marble marker is at the grave of Mattie Crawford, 1828-1898. There is surely a meaningful story attached to her grand memorial. As this photo illustrates, this cemetery, like most, is filled with many styles of stones from unadorned rocks/ fieldstones to small marble tablets to expensive stones like the ones found in the Armstrong enclosure. That is why we refer many to study the cemeteries surrounding/near our old rural churches. This is often where the most significant stories are often entered! Seeing these old churches remind me so much, when in my youth attending the Upper Black Creek Primitive Baptist Church in Bulloch County GA before the old structure was demolished and a new church built. The church was established in 1802, and family going back to great grandfather Elijah Akins are buried in the cemetery. I am extremely happy to see this. We lived just down the road from the church. I was raised in this church. My mother who was 93 and passed away January and her family were members there all thier lives. Several years ago I submitted pictures that I had taken and was told because the building had been updated that it didn’t qualify. I was very disappointed. I am so happy you have added it. It is one of the most beautiful churches. Who took these pictures? Thanks Pat. The photographer’s name is Cate Short.